Mac App Store is Open! The Mac App Store is now open for business! There’s currently over 1000 free and paid apps for you to choose from. Using your iTunes account, you can download and install great new apps in just one step! The Mac App Store offers apps in Education, Games, Graphics & Design, Lifestyle, Productivity, Utilities and many other categories. Similar to the iTunes Store, users can also browse new and noteworthy apps as we ll as staff favorites and top charts for each category. The Mac App Store is available for Snow LeopardÂ® users through Software Update as part of Mac OSÂ® X v10.6.6. For more information, see the official Mac App website. Starting your first year of college? Feeling a little lost? Not to worry! There’s an app to help you find your way around campus! Logical Dimensions has developed a variety of iPhone applications that map out some of the popular college campuses. The example app used in this review will be on the “UC Map” bundle. This app includes maps of all 10 campuses in the University of CA system. It’s perfect for college students, faculties, staff, or anyone who visits any of the UC campuses often. Also see the other campus map apps available. The app was built with simplicity in mind. To use it, scroll and select the campus map you would like to see. Once you make your selection, click on “Buildings” at the bottom. Now, select the buildings you would like to find on the campus by tapping on them. Note, you may select more than one. Once you are done with your selection, tap on “Map” at the bottom. This will pull up Google Maps with pins on all the buildings you selected. Tap on a pin and you will get options for “Walking Direction,” “Driving direction,” and “Public Transit.” Upon your selection, Google Maps app will open up, show your route, directions, and estimated time of arrival from your current location to the selected building. This will surely help you on your first week of classes. Note, the GPS coordination are not always exact, so be sure to use it only as a guidance. To test out this app, you can download the UCD Map for free. All other individual campus map apps are 99 cents, and only the UC Map Bundle is $1.99 (but includes all 10 UC campuses). See all of the Logical Dimension Apps here. I have to say, it’s a totally new gaming experience on the iPhone. With my iPod Touch (1st generation), I had to wear headphones to hear the sounds. But having the sound just play freely on the iPhone is pretty awesome. It makes making video reviews much more interesting as well! The iPod Touch and iPhone have replaced my Nintendo DS Lite for some time now. You can’t blame me since iPhone games costs so much less than DS Lite ones! And after much finger flexing and icon dragging and dropping, my gaming page is organized on my iPhone. This is only the first page out of a few, but it’s the one I use the most! The only bad part about moving over to the iPhone is having to start over on all my games. At least this time, there’s sound. :) I hope there’s a way to save games in between devices in the future. 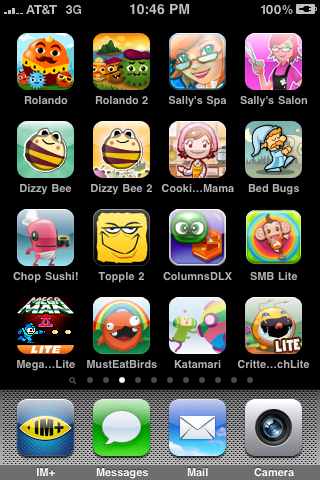 So, what are your favorite iPhone/iPod Touch games? Tip: Always try out the LITE versions (if available) before buying games. You want to know that you’ll enjoy it before making a big purchase. Enjoy! christyxcore @daynah photogene/photoforge for editing. Colorsplash, camerabag, photo fx..
NctrnlBst RT @daynah: Looking for good photography iPhone apps. Any suggestions? :) ~ Eye-Fro! Hours of fun for the entire family! johngarcia @daynah camera bag is pretty good! jackiefreeman photogene is my fave!! heyitskenn @daynah Flickit for uploading to flickr… Camerabag, nightcamera, and Pano. 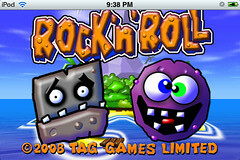 Rock’n’Roll takes a bit of getting use to, but it’s fun nevertheless. Your character stays in the middle of the screen. But the world around you moves. You can control the movement using the movement if the iPhone or by touch. I highly recommend doing the Quest before attempting the Arcade mode. I was able to go through 3 levels in Quest mode, but couldn’t pass through the first level of Arcade. The music in this game is pretty cute too.